This exhibition illustrates the impact of African Americans on life in the United States—social, economic, political, and cultural—from the death of Martin Luther King Jr. to the second election of President Barack Obama. Subjects include the Black Arts Movement, hip-hop, the Black Panthers, the rise of the black middle class and, more recently, the #BlackLivesMatter movement. This exhibition encompasses several sections focusing on the Black Power era of the 1960s and ’70s, Black Studies at universities, racial dynamics in cities and suburbs, and the changing role of the black middle class. 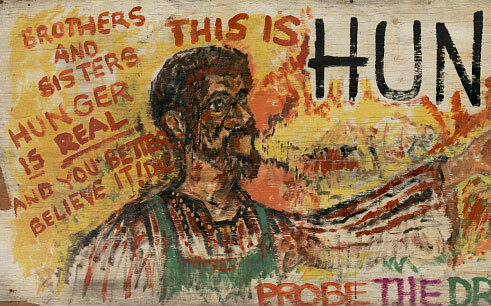 The year 1968 is seen as a turning point in the modern struggle for freedom and equality with artifacts such as painted plywood panels from Resurrection City, a “Huey Newton, Minister of Defense” poster, and handmade banners from the 2008 presidential election.